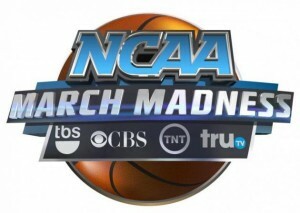 NCAA March Madness is Coming on the CBS, TBS, TNT and truTV Networks! The NCAA Basketball season is approaching the most exciting part for basketball fans AND for bar and restaurant owners – tournament time! March Madness is Coming. Your customers will want a place to go with their friends to experience all 67 of the March Madness games starting March 15th and to watch the Final Four and NCAA National Championship to be decided on April 2nd-4th at NRG Stadium in Houston Texas. The 67 games of the NCAA Basketball Tournament make it the #1 viewed event in the U.S. In 2015 March Madness averaged 11.3 million viewers per game on TV! It is sure to be a great opportunity for your Bar and Restaurant to draw in new customers. Major Conference Tournaments start in early March and the NCAA Basketball Tournament, best known as March Madness, tips off with Selection Sunday on March 13th. With 67 games being broadcast over 3 weeks starting with the First Four on Tuesday March 15th. 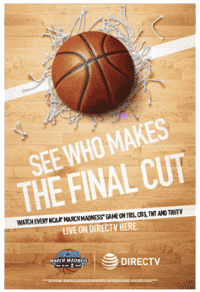 DIRECTV is making March Madness marketing kits available for FREE to DIRECTV Bar and Restaurant Subscribers and other marketing pieces are available at at deeply discounted prices. 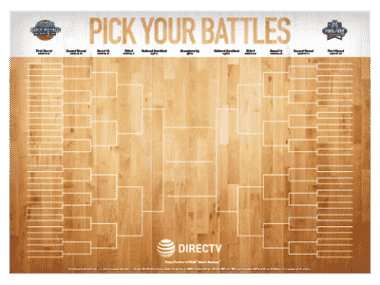 This Vinyl Wall Poster of the Tournament Brackets that was made available as part of the the 2015 DIRECTV March Madness Marketing Kits for Bars and Restaurants. A new bracket poster as well as other marketing materials will be available as part of the 2016 March Madness Promotional Kits. 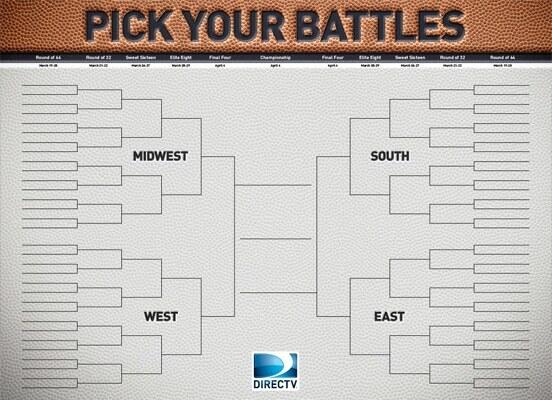 We can’t WAIT to see what the March Madness Marketing kits from DIRECTV look like in 2016. DIRECTV makes sure you can pack the house with these kits that let your customers know they can catch every game of the NCAA Tournament at your Bar or Restaurant. You can get March Madness Marketing Kits for your establishment as part of the DIRECTV MVP Marketing program. read our post on Marketing March Madness at your Bar or Restaurant.